President Trump held a powerful event Friday where a group of "Angel Families" who've lost loved ones at the hands of illegal immigrants told their stories which they said the media have ignored. CNN and MSNBC both cut away from the event. "The mainstream media does not let you know what is really happening," said Maryann Mendoza, whose son, Mesa Police Sgt. Brandon Mendoza, was killed by a drunk driving illegal alien who was high on meth. 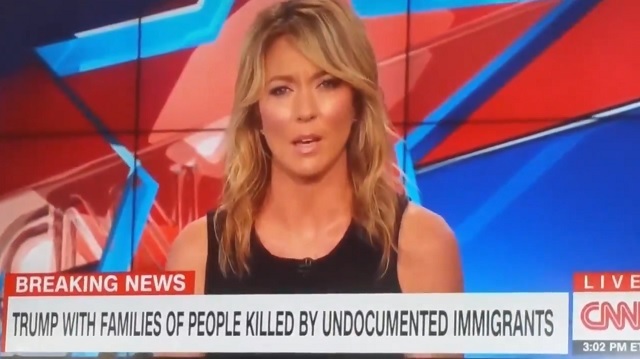 CNN cut away from the event and host Brooke Baldwin said she doesn't "know why attacks on the media are necessary there." "CNN then went to a live shot from outside a Texas detention facility for illegal immigrant children," The Washington Times reports. "The chyron read: 'Thousands of kids in limbo as Trump�s order sparks confusion.'" "MSNBC returned to its continuing coverage of the family separation issue under the banner 'families torn apart,'" The Washington Times reports. "The banner topped a chyron that read: 'Trump offers changing stories and false flames on separation of immigration families.'"